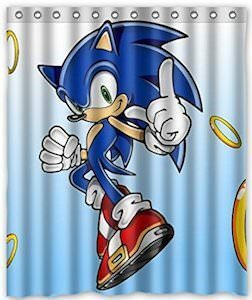 Now you can have a shower curtain that shows classic video game character Sonic The Hedgehog on it and that is way cooler than a plain boring shower curtain. The shower curtain is 60 x 72 inches and has 12 enforced eyelets for the shower hooks. On the shower curtain, you can see a light blue background and some gold rings that Sonic loves to catch and in the middle of all that Sonic The Hedgehog himself. Just put this in your bathroom and you are all ready to take a nice shower while staring at your video game favorite. Come get your Sonic The Hedgehog Shower Curtain. Now your bathroom can have a Mario shower curtain and that of course is perfect for anyone that likes Nintendo video game. 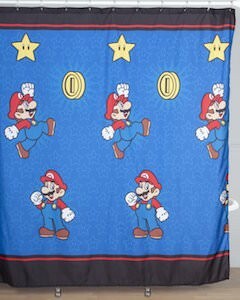 This shower curtain is 70 x 72 inch and is mainly blue with if you look closely Super Star covering the background and on top of all those stars you can see Super Mario standing and jumping and yes there are coins and some more stars to so that you really feel like your are part of a Mario game while you are showering. Why get a boring plain shower curtain when you can have one video game themed and of course that means Mario has to be there. Come and get ready for a shower with your new Nintendo Mario Shower Curtain. Now you can have a retro space scene as you shower curtain. This shower curtain shows space with stars and planets and a big space rocket. A classic look that is just great to have in your bathroom. This space ship shower curtain 69 x 70 inch and is made from 100% softened polyester so it will last a long time and keeps the water where it belongs (in the tub). With a shower curtain as fun as this you will feel so much better after you morning shower. 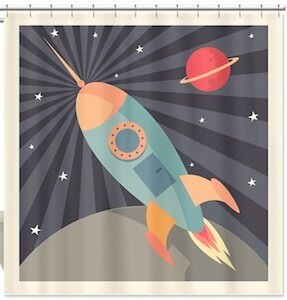 Come and admire this Retro Rocket Shower Curtain. OK so you are a tech geek and you don’t want a shower curtain with ducks, fish or other non tech stuff. 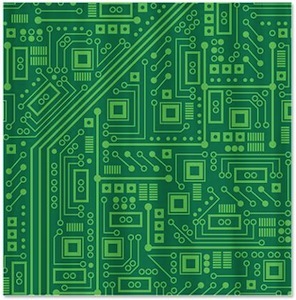 And look what we found for you a circuit board shower curtain. This shower curtain is made from 100% softened polyester and measures 69″ x 70″ just like a standard shower curtain. So if you want a nice green shower curtain then come check out this Green Circuit Board Shower Curtain. I know that lots of our visitors are or like mathematicians and astrophysicists and so that is why this post is so nice. Now you can take you morning shower with Pi or 4600 digits of it printed in gray and blue on a nice vinyl shower curtain. So if you are in need of a new or clean shower curtain then have a closer look at the Pi Shower Curtain .